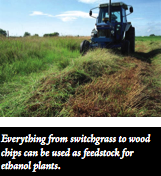 Ethanol from biomass--including wood chips and switchgrass--could be an economically competitive, usable form of energy, but its commercialization needs to be ramped up to achieve some ambitious timelines set by the current U.S. administration. It was a simple and direct statement: Americans are addicted to oil. That was one of President George Bush's core messages in his State of the Union Address earlier this year. And he outlined a solution: the President said the best way to end the country's dependence on Middle East oil was to focus on technology to produce reliable alternative energy. 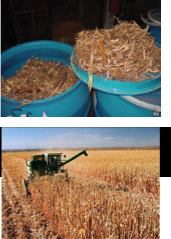 The government intends to fund additional research in cutting-edge methods of producing ethanol, not just from corn, but from wood chips, stalks and switchgrass. "Our goal is to make this new kind of ethanol practical and competitive within six years," Bush said. Currently the United States produces four billion gallons of ethanol a year from corn--that's less than three percent of the nation's 140 billion gallon-a-year fuel appetite. And as of today there are no biomass-to-ethanol refineries in the nation. The question becomes: can the United States realistically reach this ambitious goal in six years? The answer, of course, depends on who you ask. "I think the President's speech hit the nail on the head. We have all kinds of biomass available--it's the technology to convert it to an economically competitive, usable form of energy that we don't have commercialized yet," says David Bransby, professor, Energy Crops and Bioenergy at Auburn University in Alabama. "There is no question in my mind that it's feasible. We sent men to the moon 40 years ago, and that was much more difficult technologically than producing ethanol from biomass. It's our own policies that limit us. We only get 15 percent of our oil from the Middle East and we could replace that quickly. But it will require a deep level of commitment." The Bush administration has promised to put up to $160 million toward commercial development (funding up to 40 percent of the total cost of any one project). But Bransby finds the government's level of commitment disappointing. "It automatically rules out the small companies," he says. "And unfortunately, it's the small companies that have the innovative technologies." Despite the minimal funds from the government, research is taking place across the country, at universities and national labs. Researchers like Chris Zygarlicke, Deputy Associate Director for Research of the Center for Biomass Utilization at the Energy & Environmental Research Center, are looking at a variety of technologies to produce ethanol from switchgrass and other types of biomass. The Energy & Environmental Research Center, part of the University of North Dakota in Grand Forks, is recognized as one of the world's leading developers of cleaner, more efficient energy and environmental technologies. "The process for turning switchgrass, woodchips and other woody biomass into ethanol is more costly because the material is harder to open up to fermentation," explains Zygarlicke. "You can't just stick it in a yeast fermentation system and then convert it to alcohol. You have to take the cellulous and try to convert that into C6 and C5 sugars, then convert those to alcohol. There's always an upfront process involved and that's where all the research has been concentrated. If we could get the price where it would be on par with corn ethanol, then we would really have something." Another technology being tested is gasification--converting the entire carbon material to gas which is then converted to alcohol or other chemicals. Or thermochemical methods--turning the plant matter into gas using heat. Currently the cost of turning switchgrass and other woody biomass to ethanol is about twice that of corn to ethanol via fermentation. But there are many reasons to want to see the new technology succeed. 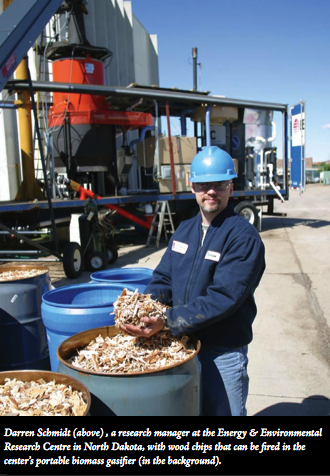 For starters, the United States has a lot of biomass available, everything from woodchips to pecan shells. Biomass would eliminate some pressure on food crops (like corn) for fuel. And biomass, such as switchgrass, has the potential to be very efficient. An acre of corn yields roughly 400 gallons of ethanol, and an acre of switchgrass could produce nearly 1,150 gallons. How does that compare to gasoline? "Many believe the energy balance for gasoline is positive," says Bransby. "The latest estimates for ethanol from corn are 1.3 to 1.7 units out for 1 unit going in. For switchgrass it's 4 units out for 1 going in. But for gasoline it's about 0.8 units out for every 1 in." "And if you believe we've got our military in the Middle East to protect our oil supply, that cost is actually an oil subsidy," adds Bransby. "If we were paying that cost at the pump, instead of through taxes, we'd be looking at over $5 a gallon. Ethanol wouldn't need a subsidy at all to beat that." Because biomass as fuel is in its infancy stages, it's impossible to know what it will look like even six years from now. Who the investors will be, whether we will be growing fuel crops and what refineries will look like -- it's all just guesses right now. Zygarlicke can see future investors needing strong incentives, and maybe not just from the federal government. "Maybe we will need to see more commercial and industrial participation like what's happening with corn. Several county-area farmers get involved in a co-op to grow the corn. It's brought to an ethanol plant and those people become shareholders in the business. Biorefineries that use lignocellulosics may need to look like that." And getting the material to the plants is a major concern. Transportation for corn is already in place, but not so for switchgrass or woodchips says Zygarlicke. Today's corn-to-ethanol plants might be retooled to make lignocellulosic ethanol. Or biomass might require its own refinery, which could cost anywhere from $100 million to $150 million. "Some think it might be more economical to have a bunch of distribution plants, each making five to 10 million gallons. But we don't really know. There isn't a plant in the country right now," says Zygarlicke. The future may be hazy, but it's hopeful. Ethanol is a growth business. The corn-to-ethanol business is seeing a boom. Just a couple years ago there were only 60 plants. The Renewable Fuels Association reports that there are now 97 ethanol plants with a combined production capacity of near 4.5 billion gallons a year. There are 33 ethanol plants and nine expansions under construction with a combined annual capacity of more than two billion gallons. Millions of vehicles on the roads can now use E85--gasoline comprised of 85 percent ethanol and 15 percent gasoline. The number of E85 fueling stations has exploded. As of early 2006, there were 650 retail stations offering E85 across the country, a more than 300 percent increase from 2004. Bransby believes the sudden interest by the government and the country to pursue ethanol stems from a combination of events. First, oil jumped from $20 to $70 a barrel within a few years. Second, is the ongoing war in Iraq and third is last season's hurricanes. "It made us realize just how vulnerable we are. We went from $2.50 to $3.50 a gallon in a matter of a few days. And we actually ran out of gas at many filling stations here in Alabama." Corn is turning out to be an economical fuel and a solid step away from gasoline, but it's only one of many steps. The corn industry is very innovative," says Zygarlicke. "But I think it can only go so far with the acreage that it has to supply large quantities of ethanol. Although it has a ways to go, there's going to come a point where we're going to have to turn to lignocellulosics as a feedstock for ethanol production. I believe we're one to three years away from really seeing something get started at a very small scale." Bransby likens it to the Space Race: "There are a bunch of technologies out there that are pretty close to commercial--very, very close. What we need now is to move this whole concept forward. We need a commercial plant producing ethanol from cellulosic biomass. I believe the reason we don't have it yet is more because of no enabling policy rather than the technology not being there. China and India are going to be ahead of us in no time." "I think it's going to take an enormous effort to get to the point that we are producing our own fuels," says Zygarlicke. "We won't be eliminating fossil fuels in the next 10 years, but I can see a significant replacement of fossil fuels occurring in the next 20 years. And it's going to take all the pieces--renewable and clean fossil fuels--to produce our electricity, our chemicals and our fuel. At least in our generation it will, and probably our childrens'. After that, we may have to get more exclusive." "We have hundreds of years of coal reserves and several hundred years of uranium for making electricity and even transportation fuels, as long as we develop these technologies in a safe and environmentally friendly manner. "However, we will see a decline in petroleum reserves much faster, so alternative fuels and energy production forms are a must. If we go to a hydrogen economy, then maybe we produce all of our hydrogen using biomass and wind, which are the two most promising renewable methods for hydrogen production. It's going to take all forms of energy and fuel production to supply the rising demands worldwide and it's up to researchers right now to get these technologies sorted out." of our lives. Students are going into the field. Renewable energy is getting into college curricula as Professor Bransby can attest. Even high school teachers are discussing subjects centered around renewable energy. It's a bit on the technical side, says Zygarlicke. "But it's a great business to be in."